BugDoc Dave here and it’s time for another Tuesday Stretch! 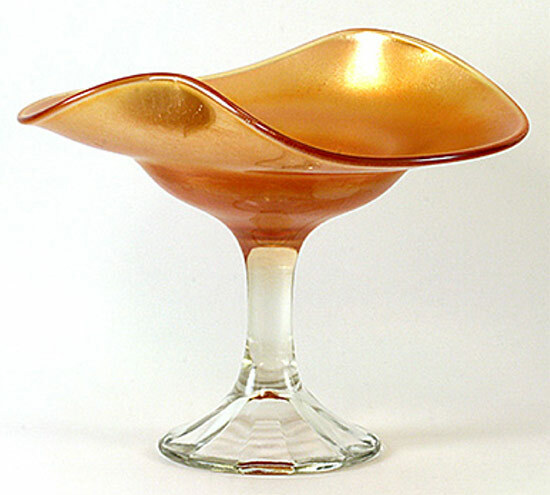 I was going to cover the unique stretch glass items, cheese and cracker sets (which will need two editions), but since Brian has challenged us to show him our “marigold” pieces, I’ll toss in some stretch marigold. I find it really interesting that Imperial and was the only major company that made a true stretched marigold. 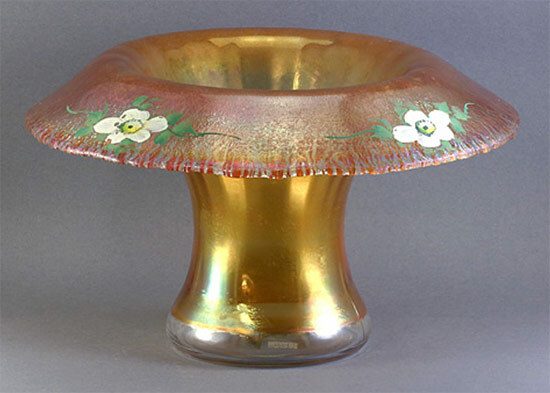 Fenton’s Grecian Gold and Diamond’s Gold are usually shiny or satiny marigold, and only occasionally have hints of a stretch effect (being reheated and shaped after doping). Both companies used these names when discussing other stretch colors, so they are definitely included in their stretch lines. Northwood made a few pieces of marigold stretch early on, but soon concentrated on their normal Rainbow line colors of Topaz, Blue, Russet and Jade Blue. 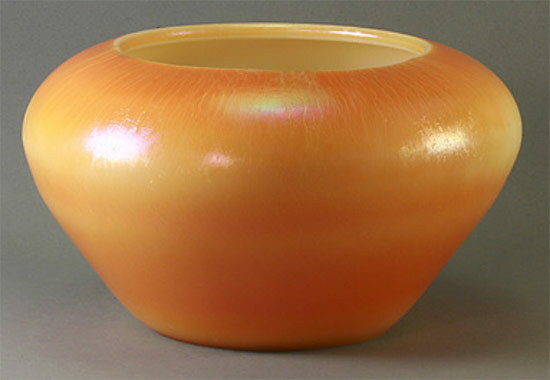 Here is a Fenton #603 bowl, cupped in (i.e., aquarium shape) in Grecian Gold. 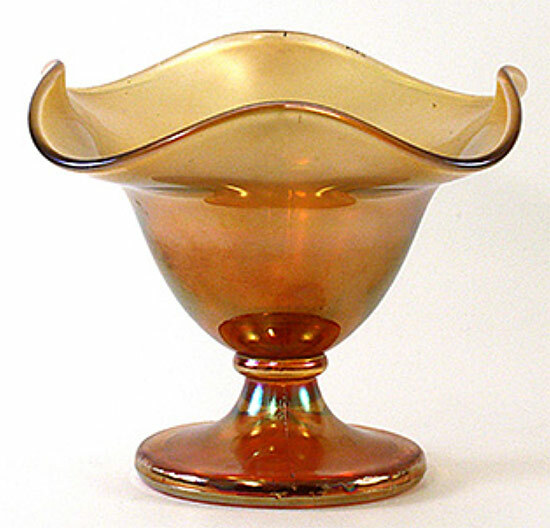 And, here is the Fenton #9 comport with a square top in Grecian Gold. Northwood’s marigold stretch usually has pretty good stretch marks and it is most commonly found in their “Tree-of-Life” pieces. Some of these pieces appear to be double-doped with a crystal dope going on first, followed by the marigold. 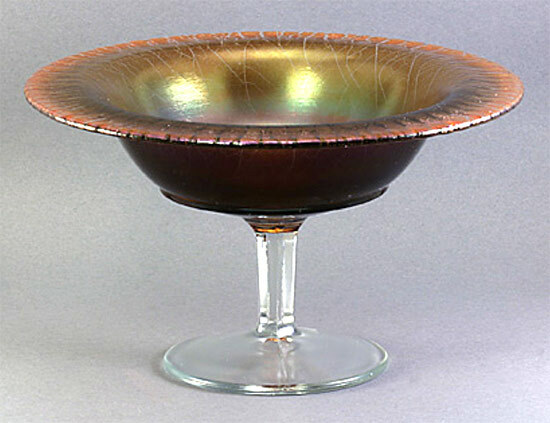 This gives the pieces a two-toned effect like in this comport where the base has crystal iridescence and the bowl area has the marigold. Without a doubt, the master of stretch marigold pieces was Imperial. In the Art Glass Line (i.e., Jewels), their Pearl Ruby can’t be beat! It is usually a deep, pumpkin marigold with intense stretch effects. This is the Imperial Art Glass bowl #46 in Pearl Ruby. Imperial also used the Pearl Ruby spray on milk glass pieces, but more than half of these appear to have a shiny surface. The ones with true stretch effect are knock-outs! This is an Imperial, cross-marked, #78 bowl showing the Pearl Ruby on milk glass. In Imperial’s “Satin Iridescent Colors” (the name applied to their more common line of stretch glass), Rose Ice was the name they used. This effect can range from a nice, light marigold color, to a dark brown effect (probably over-doped). 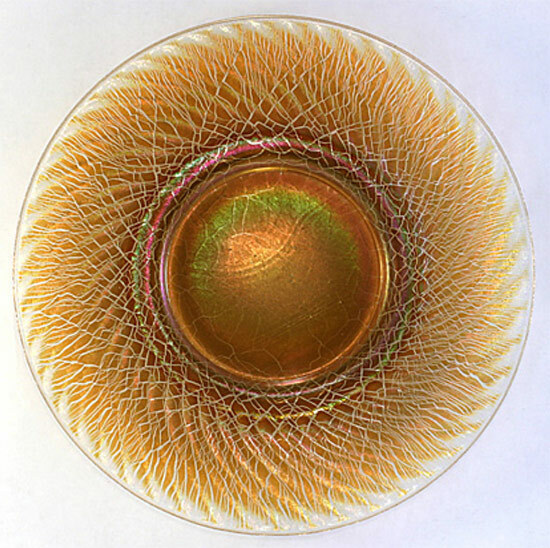 This effect is most commonly seen on their 8-inch, wide panel plates and handled servers, but it was also used on many other items, but not commonly. 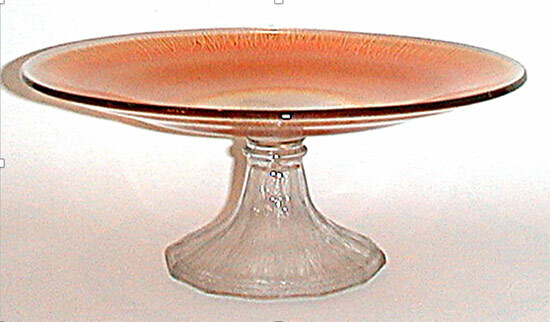 Imperial handled server in a nice Rose Ice with cutting through the iridescence. 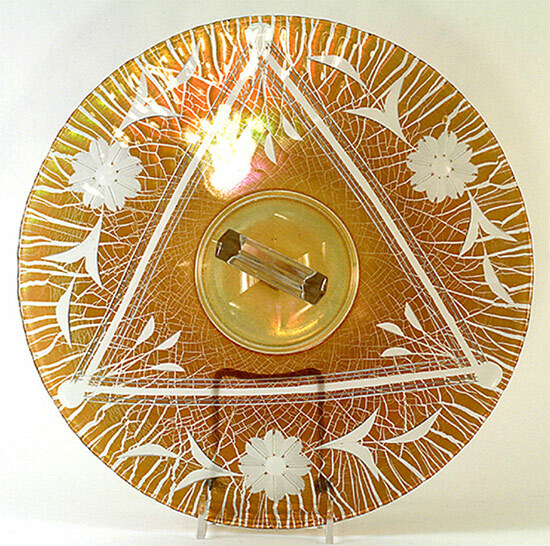 Here is an 8-inch plate with the swirl optic interior. Notice that the Rose Ice is almost dark brown in the interior! The final two companies that made marigold stretch are two of the smaller makers, Jeannette and Lancaster. 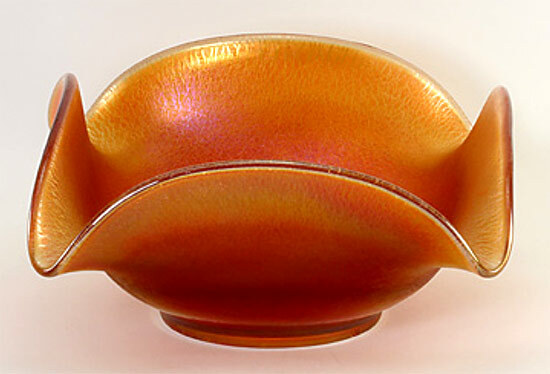 Jeannette made several bowls that most commonly come in marigold stretch. When well done, the stretch iridescence rivals those done by Imperial, but others are a rather plain, light marigold. 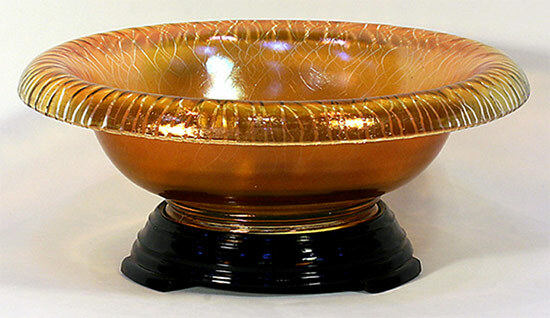 Here is one of their larger bowls (10-inch wide) with a rolled rim and outstanding Amber marigold stretch effect. 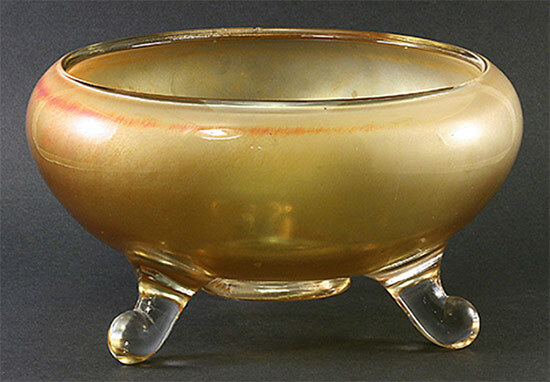 Catalog pages and trade articles about Jeannette’s glass indicate two marigold colors – Gold (a light iridescence, and Amber (a dark marigold). Lancaster also listed two marigold colors – Aztec (a light marigold) and Rose Ice (a dark, often brown marigold. This pea vase with enamel decoration is in Aztec. And, here is a Lancaster comport in the Rose Ice.